After earning a B.S. 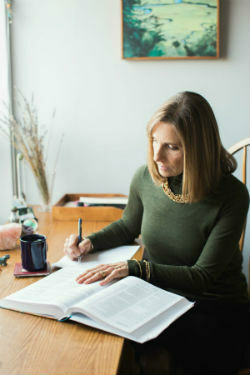 in Occupational Therapy, Master’s Health Profession, Physician Assistant Degree, Lindy pursued her interest in Integrative Medicine and received a Diploma in Advanced Clinical Homeopathy. Uniting knowledge from diverse health paradigms, Lindy conveys a deep understanding of the art and science of Integrative Medicine. Clinical experience includes an Occupational Therapy private practice, Emergency Medicine, Family Medicine, and Integrative Medicine with a subspecialty in Pediatrics. Embedded in the depths of medical knowledge, she enlightens her patients with the life lessons cultivated from 25 years of mindful parenting. Lindy’s engagement in integrative medicine expands beyond the walls of Fal River Health Center to local and global communities. In 2001, she was chosen as a homeopathic consultant for an NIH grant to the Maine Medical Center, Family Practice Residency Program; the funding supported physician’s awareness of CAM therapy in patient care. Since the inception of the MMC Department of Integrative Medicine, she has mentored residents and Fellows, sharing her expertise at monthly rounds. Lindy is a well-respected presenter to regional, national, and international audiences. She shares her expertise and visionary ideas at schools, colleges, and hospitals. Participants learn practical strategies to live well and learn well. Apart from practicing medicine, Lindy cherishes time with family and friends. 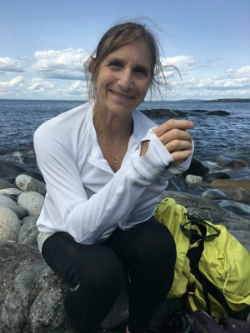 She appreciates being in nature and her intrepid spirit enjoys running, biking, Nordic skiing, sea kayaking, ocean swimming, and yoga. Lindy models the spirit of a mind-body lifestyle.